Rates start at $749 per night. 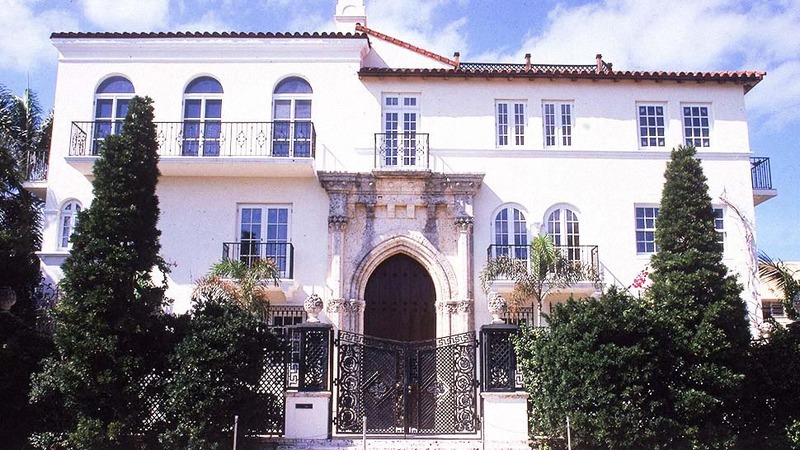 Serial killer Andrew Cunanan murdered Gianni Versace on the front steps of the fashion designer's Miami Beach mansion in 1997, and now those stone steps provide the backdrop for dozens of tourist photos on a daily basis. But not only can tourists (and fans of FX's upcoming American Crime Story miniseries, which focuses on the murder) photograph the house, they can stay there overnight. 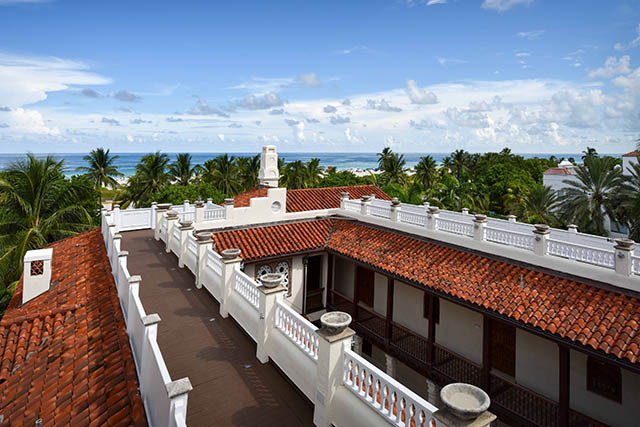 Scroll down for a look inside the boutique luxury hotel known as the Villa Casa Casuarina. 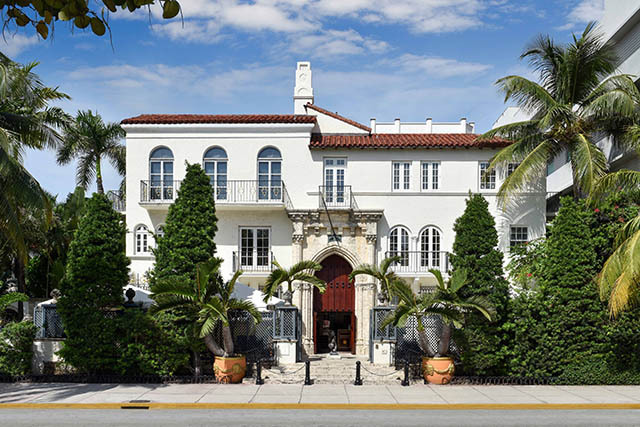 The three-story building was originally built as an apartment complex by Mayflower descendant and Standard Oil heir Alden Freeman in 1930. 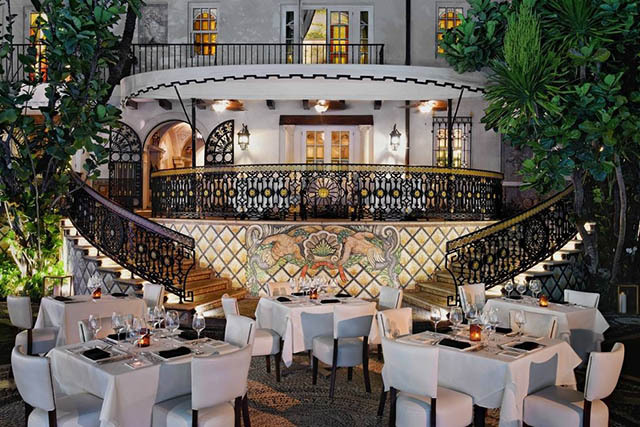 In 1992, Versace purchased the original house for $2.95 million and the Revere Hotel next door for $3.7 million. 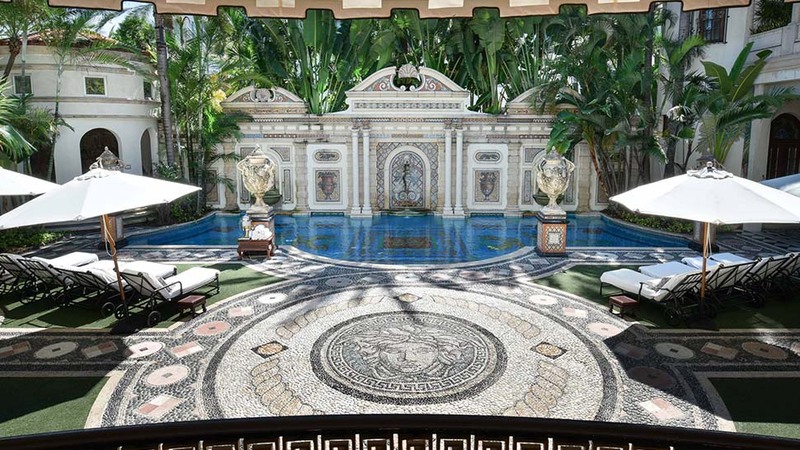 He spent an astonishing $32 million on renovations that included demolishing the Revere to make way for a pool, garden, and new south wing of the home. 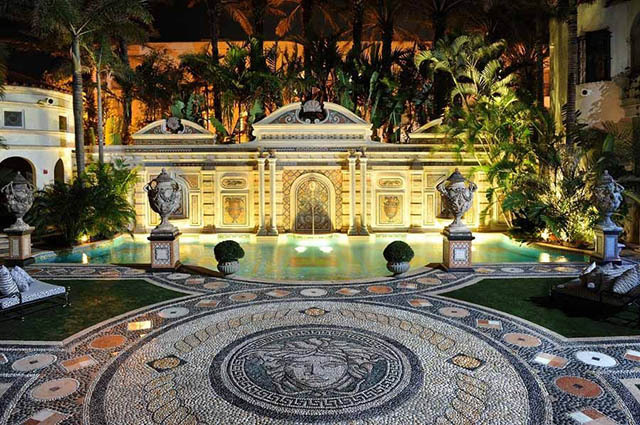 Versace turned the 24 apartments into 10 large suites in the original house. The designer built an additional two suites in the south wing. 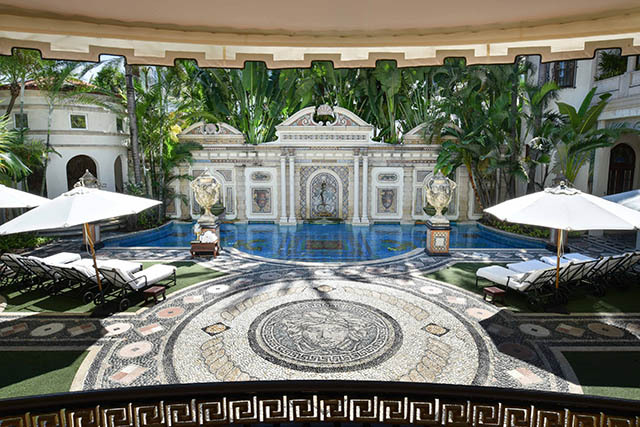 He lined the pool with 24-karat gold tiles. 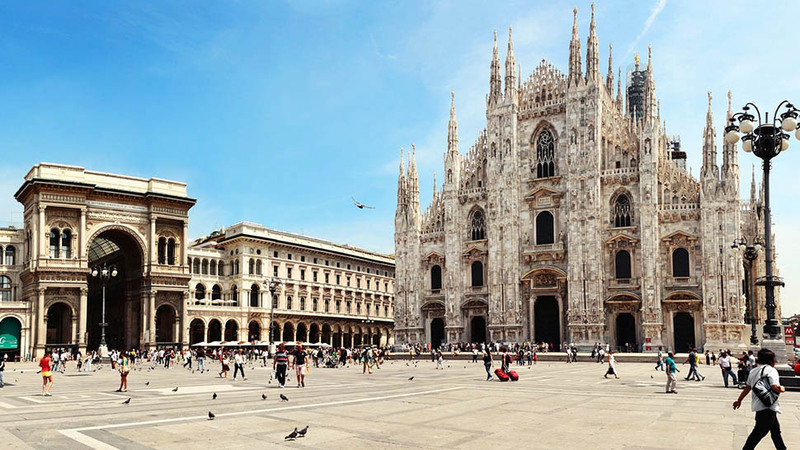 In addition to the guestrooms, it operates the restaurant Gianni's, which "offers a delicious blend of Italian and Mediterranean food and wine selections." 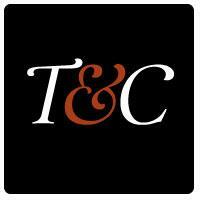 Decadent dishes include gnocchi di granchio, with New Orleans blue crab, vermouth wine, shallots, parmigiano-reggiano, truffles, and filetto di manzo rossini, with eight-ounce Wagyu filet mignon, pomme confit, grilled asparagus, pan-seared foie gras, and Bordelaise jus. 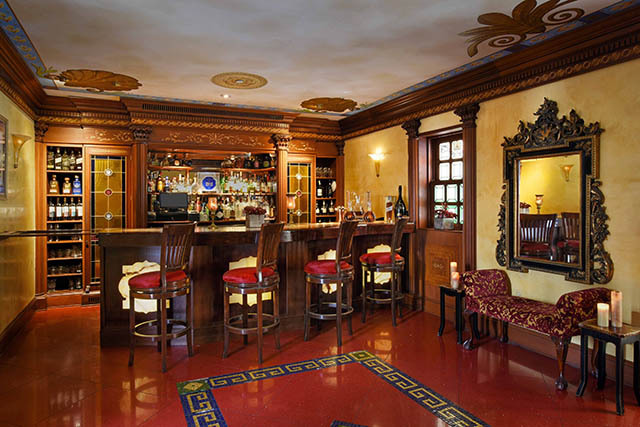 Reservations are required for dinner, but guests can walk into the bar for drinks. 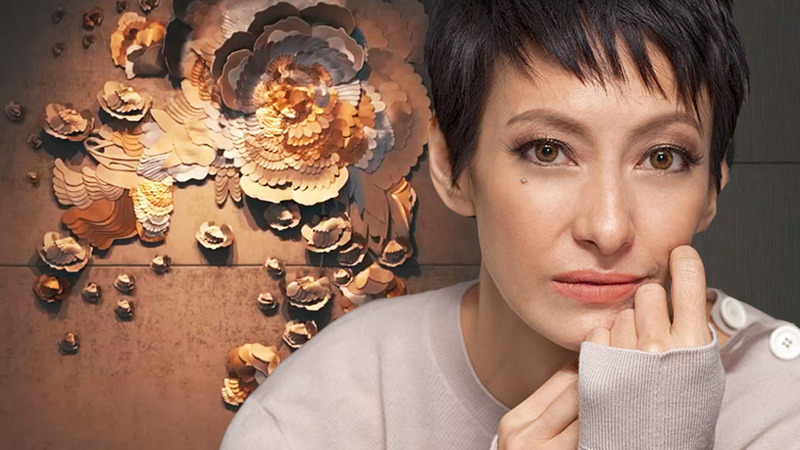 American Crime Story was filmed over the course of about a month at the hotel. Producer Ryan Murphy told the New York Post he couldn’t believe that he received permission to shoot the series there. "I don’t think I could have made the show if I couldn’t have gotten that house,” he said. “There was no way you could build [a set] of it. 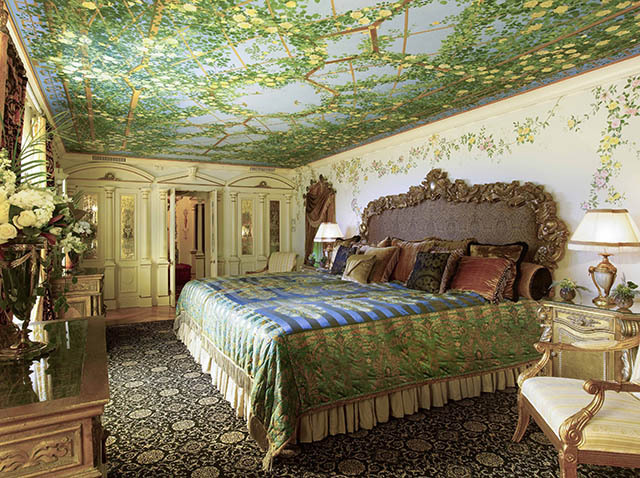 Two of the rooms were made out of seashells. 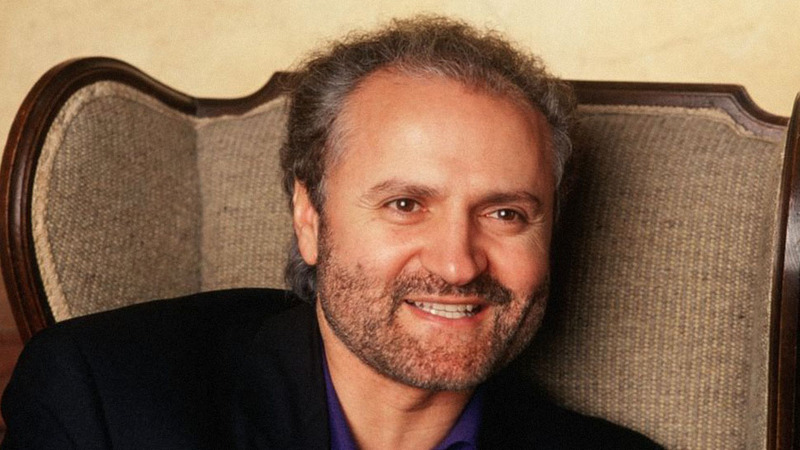 [Gianni Versace’s sister] Donatella [Versace] took all the furniture and the art when she sold the house, but through pictures, we were able to recreate them." A resident artist maintains the artwork that Versace commissioned for the property. 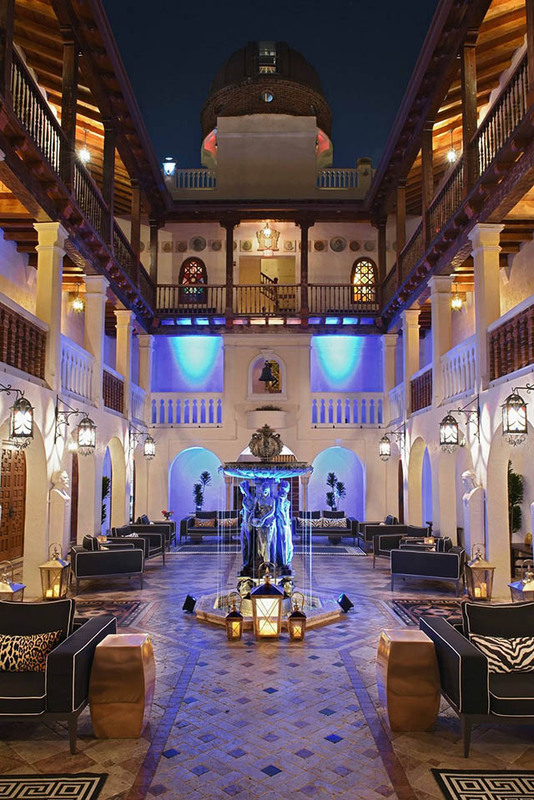 "We actually have preserved what Versace created here and just augmented it with some modern touches for the convenience of our hotel guests and restaurant patrons," Chauncey Copeland, the hotel’s general manager, told the Associated Press. They include this mosaic of Versace's signature Medusa head. 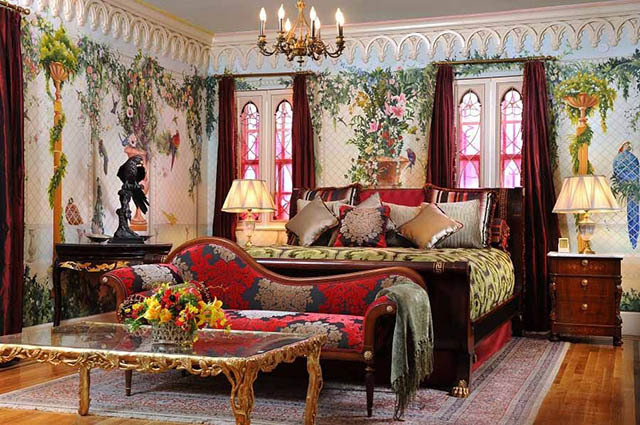 The Villa Suite is the designer's former room. 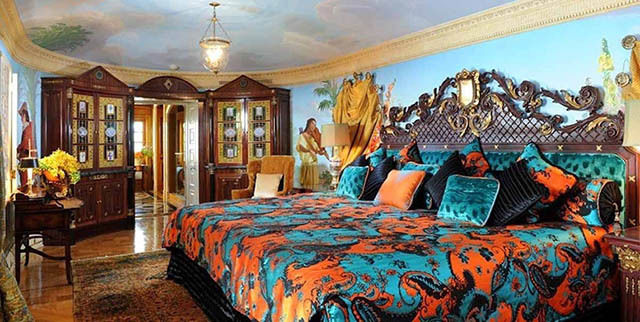 The Venus Suite was where his sister Donatella Versace stayed. Rates for one-bedroom suites start at $1,199 per night. The hotel is on Ocean Drive, a few steps away from the Atlantic Ocean. 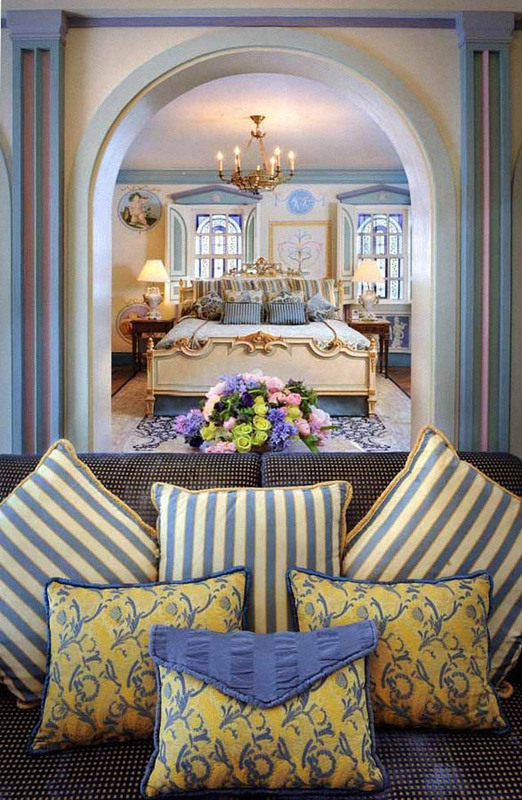 The blue-and-cream-colored Azure Suite includes a king bed and two full-sized beds/sitting alcoves. 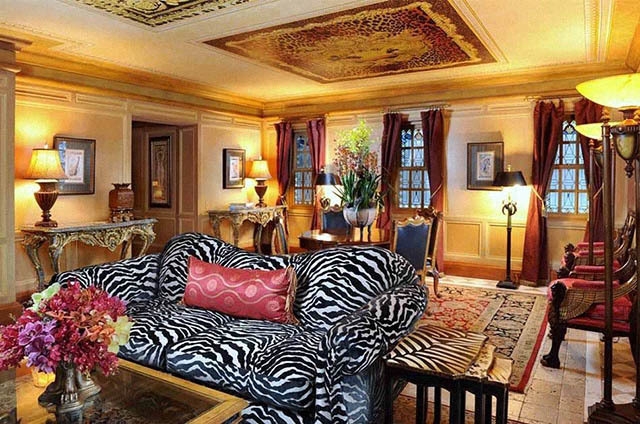 Rates for a Superior Suite, like this one, start at $749 a night. 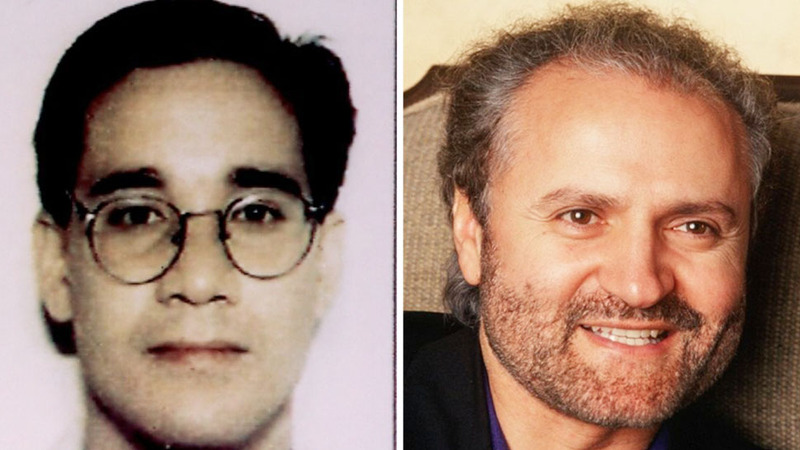 Who Was Andrew Cunanan, the Man Who Murdered Gianni Versace? There's something special about seeing a royal truly break it down. The backstories behind the second episode's memorable lines are filled with amazing details. 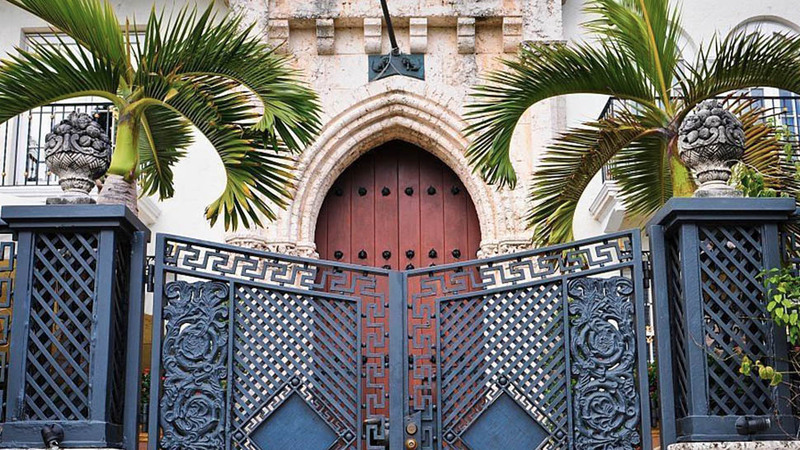 There's a wine cellar, private elevator, and much more. From their 2005 college graduation to today.